Exclusive Deals From Chatrium at the 48th Thai Tiew Thai Fair! Are you planning a memorable meal, a vacation or a staycation between now and March of next year? As you may realize, the high season for tourism is approaching, and that means hotel rates will soon be rising. But we have great news for you, as Chatrium Hotels and Residences is offering a remarkable range of promotional prices exclusively at the 48th Thai Tiew Thai Fair! We will be waiting to see you at Booth P240 and the corner Booth P241 in the Plenary Hall at Bangkok’s Queen Sirikit National Convention Center (QSNCC) from 30 August – 2 September 2018. Drop by and check out the fantastic deals! Whether all you desire is a magical evening of fine cuisine in luxurious surroundings, a change of pace in extraordinary lakeside comfort by the Shwedagon Pagoda in Yangon, a golf resort in a breathtaking highland sanctuary in Chanthaburi, or a venue to match your preferences and fulfill your pleasures in Bangkok, Chatrium Hotels and Residences has the means to make you Feel the Remarkable. Our Bangkok properties range from the Chatrium Hotel Riverside Bangkok and its captivating riverside charm, to the iconic Emporium Suites by Chatrium for those enchanted by the Sukhumvit shopping district, the Maitria Hotel Sukhumvit 18 for savvy independent travellers, or Chatrium Residence Sathon Bangkok for those seeking stellar facilities to cover every possible need, from fully equipped kitchenettes to shuttle services branching across the city. The following prices are available only to Thai citizens and local expats who pay a visit to the 48th Thai Tiew Thai Fair, so come and see for yourself why the Chatrium Hotels and Residences’ lifestyle opportunities are so attractive! Flush on the banks of the mighty Chao Phraya River, this hotel offers 5-Star luxury and the best views of the river and the cityscape in Bangkok. A Grand Room City View is available for only THB 3,800 net per night, and a Grand Room River View for THB 4,300 net, including daily buffet breakfast for up to 2 persons, in-room Wi-Fi, swimming pool, fitness centre, sauna and daily shuttle boat service to the BTS Taksin Skytrain station from 06.00-23.55 hours. Enjoy an All You Can Eat Dim Sum Lunch at THB780 net per person, including Chinese Tea and Chrysanthemum Tea. Validity is 30 August 2018 to 28 February 2019 (blackout periods: public holidays and special events). As an additional special promotion, purchase any 10 vouchers and receive 1 complimentary voucher. Buffet Dinner at THB1,100 net per person including free flow of soft drinks Sunday to Thursday. Remarkable Weekend Buffet Dinner at THB1,290 net per person including free flow of soft drinks Friday and Saturday. Validity is 30 August 2018 to 28 February 2019 (blackout periods: public holidays and special events). Embrace iconic living in a Studio Deluxe for THB4,500 net with daily breakfast for 2 persons, including in-room WiFi and unlimited wired internet access. This price is available from 30 August 2018 – 31 March 2019 with no blackout periods. All you can eat Dim Sum Lunch at the special price of THB699 net, down from THB750 net. Available Monday to Friday from 11:30 a.m. – 2:00 p.m.
All you can eat Weekend Dim Sum Lunch at the special price of THB799 net, down from THB899 net, including Peking duck, suckling pig and Chinese Ocean Soup. Available Saturday and Sunday from 11:30 a.m. – 2:00 p.m. The blackout days are 31 December 2018, 1 January 2019 and 5 February 2019. Lock in this remarkable deal for a 34-sqm Standard Room at THB2,500 net per night with daily breakfast for 2 registered guests, in-room WiFi, unlimited wired Internet access, and 3 free cans of soft drink per stay. Stay savvy from 30 August 2018 to 31 March 2019 with no blackout periods. Luxuriate in extraordinary lakeside comfort in a Deluxe Room City View at THB3,350 net with daily buffet breakfast for 2 persons, a welcome drink at the Sunset Terrace, in-room fruit platter and floral arrangement, unlimited Internet access, free shuttle service to Shwedagon Pagoda, the Scott Market and downtown, and a buy 2 get 1 free deal for a Business Set Dinner or Lunch for 2 persons at any of our three fine restaurants (international and Thai cuisine, Chinese Cuisine, or Japanese cuisine). Available 1 October 2018 to 31 March 2019 (blackout period 24 December 2018 – 5 January 2019). Book a Studio in this contemporary city oasis for THB2,600 net per night, or a One Bedroom Suite for THB2,800 net per night, including daily buffet breakfast for up to 2 registered guests, in-room WiFi and unlimited wired Internet access, fitness centre, sauna, daily shuttle services to nearby mass transit stations and shopping complexes, 10% discount on food and beverages at the hotel restaurant, 10% discount on laundry and dry cleaning services, and a 25% discount on spa and massage treatments at the Green Leaf Spa. Available 30 August 2018 to 28 February 2019 with no blackout periods. You may have heard that perhaps the finest golf course in Thailand is tucked away in a breathtaking highland sanctuary just 3 hours from Bangkok. Act now to book a Deluxe Room at THB1,900 on a weekday or THB2,200 on a weekend. As a special promotion for larger groups, buy 10 of either coupon and get 2 free! Green fees are also discounted at THB700 on a weekday or THB1,000 on a weekend, with special bulk deal to buy 5 and get 2 free! Or go for the all-inclusive Green Fee Coupon including green fee, caddy and golf cart for 18 holes. Buy 1 book of 10 coupons for THB18,000 and get 2 free coupons. These amazing prices are available with a reservation at least 14 days in advance from 30 August 2018 to 31 March 2019 (blackout period 30 December 2018 to 2 January 2019). 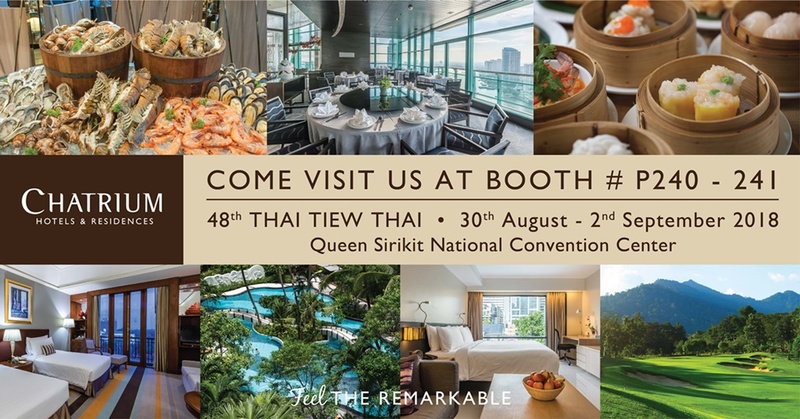 For a stay that exceeds your every expectation or a meal of the finest fare visit Chatrium Hotels and Residences at Booth P240 and the corner Booth P241 in the Plenary Hall at Bangkok’s Queen Sirikit National Convention Center (QSNCC) from 30 August to 2 September 2018 at the 48th Thai Tiew Thai Fair. Come visit us to make sure you can make your high-season high jinks happen at remarkable prices!